Adjectives like warm, friendly, and culturally affluent are mere words when you are asked to describe about the beauty of Lebanon. With the ever-changing landscape that transforms conforming to the variations in season, Lebanon is a destination where fun never ends. Be it the nature, beaches, activities and the wonderful attractions of the country, there is much to explore and experience in Lebanon. The country has some very beautiful and striking cities to discover, such as Beirut, Tripoli, Byblos, Sidon, and Jounieh to name a few. The country of Lebanon is in the Asia continent and the latitude and longitude for the country are 33.9270° N, 35.6951° E.
The capital city of Lebanon is Beirut. Owing to its location (at the midpoint of Lebanon’s Mediterranean coastline), Beirut is considered the largest and main seaport of the country. 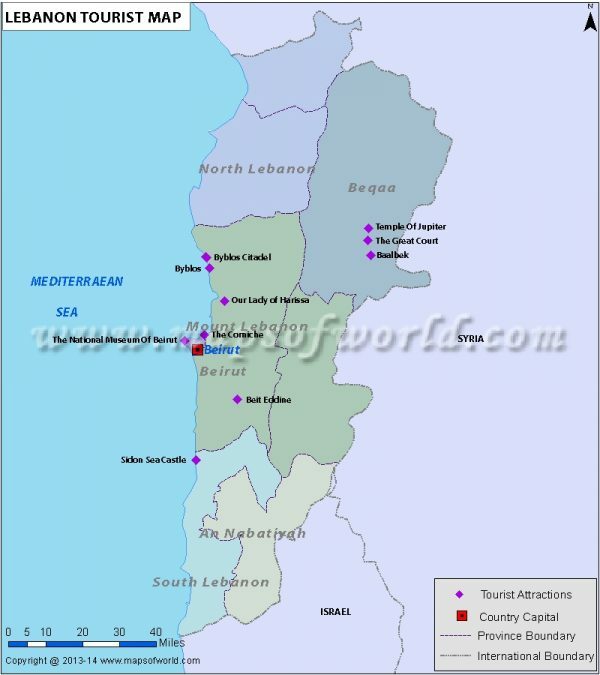 Lebanon covers a total area of 4,036 square miles. Most of the landscape of the country is covered by mountains. Lebanon is divided into six governorates that are further divided into twenty-five districts; the districts are further divided into many municipalities. Beirut – the capital city of Lebanon survived a dark history. Take guided walking tours across Beirut to know about the troubled past of the city. These walking tours cover interesting places in Beirut such as Place d’Étoile, the Jewish quarter, Martyr’s Square, and the Roman baths. 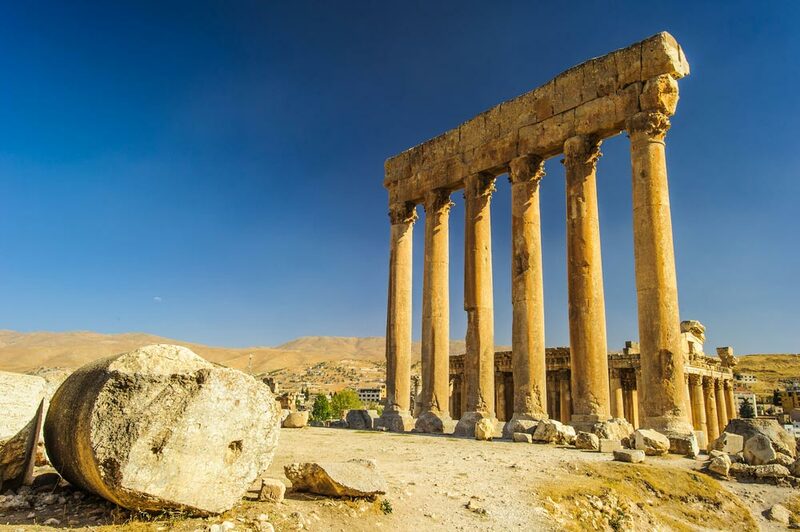 Baalbek or the ‘Sun City’ as named in the ancient times is the home to some of the most striking and significant ancient Roman sites, including best preserved Roman temples namely the temple of Jupiter and Bacchus. The city of Byblos is one of the oldest Phoenician cities. It became a UNESCO World Heritage Site in 1984. Other stunning attractions that complete your tour to Lebanon include the Jeita Grotto, Kadisha Valley, Mzaar Kfardebain, Mohammed Al Amin Mosque, Mansouri Great Mosque, Saint George Maronite Cathedral, and Byblos Castle. The historic past of the country can be dug more in the museums of Lebanon such as the National Museum, Sursock Museum, and Gibran Museum. However, it is important to note here that travelling to some areas of Lebanon has been advised against by the Foreign and Commonwealth Office (FCO) of the country. These areas include Tripoli, refugee camps of Palestinian, areas around the Syrian border, Arsal, Baalbek, Bekaa Valley, the southern suburbs of Beirut east and west, Saida and South of the Litani River. This is because the security situation in these areas in Lebanon keeps fluctuating and can get worse anytime due to high threats of terrorism. Hotels in Lebanon are far too many. Each city has a sizable number of hotels and they cater to the demands of their guests. The guests are treated to some great hospitality and are spoiled for choices. Hotels in Lebanon include a number of resorts, first class hotels, budget hotels as well as motels meant for the respective client groups. Tourists who are not in a position to loosen the strings of their wallet can always opt for the comparatively economic motels in various cities of Lebanon. The motels assure the visitor of a comfortable stay within a constrained budget. Most of them offer the basic facilities to the guests. The standard rooms are fit for couple occupancy. Cities like Beirut, Bhamdoun, Tripoli, Zahle, Dbayeh, Kfardebian and Raouche Beirut provide ample options in this respect. A truly magical holiday in Lebanon calls for a stay at one of the Lebanon Spa Hotel. The luxury spa resorts in Lebanon offers a chance to relax in a majestic manner and to indulge in a never before spa experience. The quality spa treatments rejuvenate the senses. The spa resorts assure its guests world class hospitality. The Essential Spa at the Moevenpick Hotel and Spa Resort Beirut is known across the world .The ayurvedic spa treatments that the spa offers its guests is not only refreshing but is an altogether different experience. One of its popular treatments is the Chocoholic treatment. To be covered with ground almonds and dark chocolate, and then a chocolate bath and massage and then being draped in a ‘chocolate envelope’ is an exhilarating experience. The luxury hotels Lebanon would make your travel to Lebanon most memorable and comfortable. The hospitality offered by the luxury hotels in Lebanon is worth mentioning. Lebanon Resorts truly match up to international standards in terms of hospitality and services. They are amongst the top class resorts and luxury hotels of the world. Mention of resorts in Lebanon immediately calls up the name of Movenpick Hotel and Resort in Beirut. It is a first class resort in Beirut with a panoramic view of the Mediterranean coastline. It is well known for its resort facilities, superior accommodation facilities, a great spa and a supreme dining experience. Situated at a little distance from the Beirut International Airport, the resort has 292 rooms furnished with all the basic amenities. The guests are welcome to mix business with pleasure as the resort is replete with such facilities as a photocopier, speaker phones, and secretarial assistance and plug-and-play wireless options. The Essential Spa and Health Club at the resort is an added attraction for the tourists as they indulge themselves in relaxation of their body, soul and mind. Beirut Hotels combine the very best in terms of accommodation, amenities, food and overall hospitality. Hotels in Beirut range from grand resorts and five star hotels to budget hotels and even comparatively cost effective motels. The hotels are more or less close to the heart of the city and that makes it easier for the tourist to make their stay all the more fruitful and enjoyable. One of the premier hotels in Beirut is the Al Bustan Beirut. The hotel boasts of 117 air conditioned rooms replete with all modern amenities. Looking out from the Al Bustan one can enjoy a breathtaking view of the Mediterranean shoreline. It offers its guests with several facilities including round the clock room service, swimming pools, conveyance facilities, conference facilities, medical assistance, babysitting facilities and a state of the art gymnasium.